On April 9, 2018, early morning, two Israeli F-15 jets crossed into southern Lebanon and launched a number of missiles at Syria’s strategic Tiyas (T-4) airbase in Homs province. The Syrian Observatory for Human Rights reported that at least 14 people were killed in the strike, including four Iranians. The Israeli government has not publicly acknowledged that it was behind the attack. The airbase is halfway between Homs and the ancient ruins of Palmyra, has been used by the Russian air force in the past, but it is unclear whether Russian aircraft were at the base when it came under attack. Earlier in February, Israeli Air Force jets hit the same facility, which the Israel Defense Forces (IDF) says was the command and control center for an Iranian drone that penetrated Israeli airspace, before being shot down. The attack took place hours after U.S. President Donald Trump warned of a "big price to pay" following the reports of a poison gas attack on the rebel-held town of Douma which killed dozens of people, including children. Trump and Western allies have been discussing possible military action to punish Syria's President Bashar al-Assad for the attack. After the attack, Syrian state-run news agency SANA, initially reported that the attack was "most likely" American, a claim the Pentagon has denied. Dmitry Peskov, the spokesman for Putin, told reporters on Monday that Israel had not spoken to the president ahead of the air strike even though there may have been Russian military advisers at the base, which he described as "a cause for concern for us." The Kremlin said the two leaders "discussed recent Israeli air strikes against the T-4 airbase," and Putin called on Netanyahu not to take any action that could "further destabilize" Syria. Putin "stressed the importance of respecting Syria's sovereignty," the Kremlin's website said. 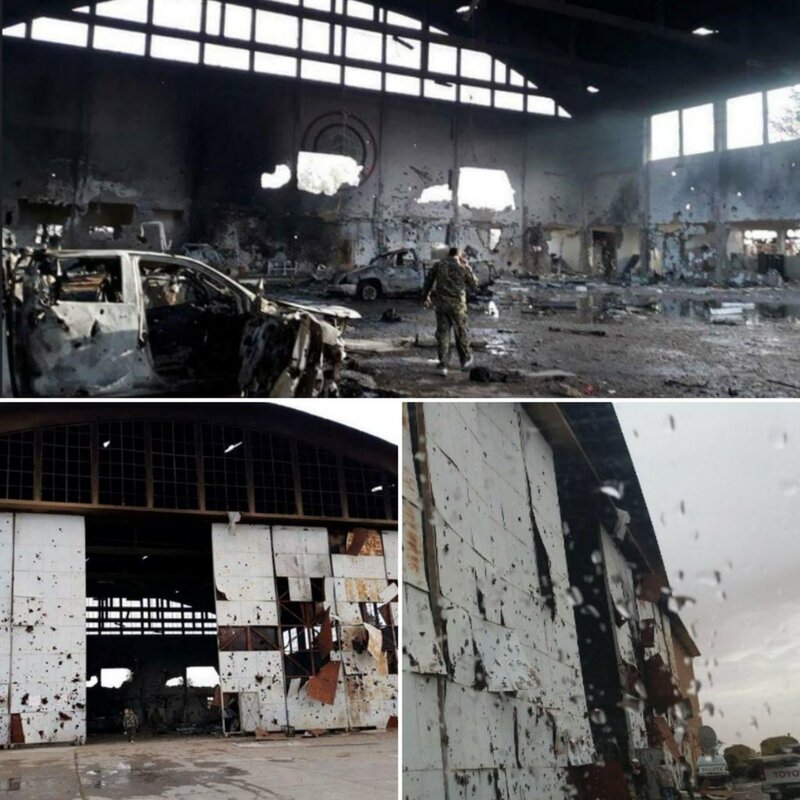 Image Attribute: Photos from the air base seem to show a Syrian soldier inspecting a large hangar-style building with heavy damage. / Source: Tasnim News Agency's Twitter handle. Missiles fired by Israeli jets were directly aimed at a hangar in a secluded compound on the west side of the airfield. The building was used by Iran’s expeditionary Quds Force, the foreign wing of its Islamic Revolutionary Guards Corps (IRGC). IRGC-affiliated Fars news agency has thus far confirmed that four Iranians were killed in Israeli air strikes - Col. Mehdi Dehghan, Seyyed Ammar Mousavi, Akbar Javar-Jannati and Mehdi Lotfi-Niasar. Col. Dehghan was a senior officer in Iran's unmanned aerial vehicle program. Israeli Prime Minister, Benjamin Netanyahu has repeatedly warned Iran against trying to establish a permanent military presence in Syria, where it has been Assad's staunchest ally in a seven-year civil war against Sunni rebels. After the air strike, Tehran warned that it would retaliate against Israel - On April 10, 2018, speaking in Damascus at a two-day conference on Jerusalem, a senior advisor to Iran's Ayatollah Ali Khamenei, Ali Akbar Velayati, told Iran's state-run Islamic Republic News Agency (IRNA) that Israel's "crimes will not remain unanswered." This has prompted Tel Aviv to put its military forces on high alert. Before this year's confrontation, Israel and Iran engaged each other during Mazraat Amal incident in January 2015 in which Brigadier-General Mohammad-Ali Allahdadi of Iranian Army of the Guardians of the Islamic Revolution (Sepâh-e Pâsdârân-e Enghelâb-e Eslâmi) was killed, alongside six Hezbollah fighters. In retaliation, Hezbollah fired anti-tank missiles at Israeli vehicles operating near the Lebanese border, killing two Israeli soldiers.